Soldiers use DCGS-A software at Aberdeen Proving Ground in Maryland. "We're no longer just hurling mass and energy at our opponents," says John Arquilla, a professor of defense analysis at the Naval Postgraduate School. "We're using information as well, and the more you know, the less of the older kinds of weapons you need." To process that information efficiently, however, the war-fighters need computers and software. They once went into battle armed mainly with a rifle; now they need a laptop and reliable software. For the U.S. military, the selection of an appropriate data-analysis program can be as contentious as the choice of body armor or a rifle. In Afghanistan, the most lethal challenge for U.S. troops comes from the enemy's use of roadside bombs — improvised explosive devices. Troops now deal with IEDs — "pots" in war parlance — in large part by gathering and analyzing information about where the bombs are being planted, by whom and using what materials. With the right software, intelligence specialists can actually identify the network behind a bomb-making operation. "If you have a system that a soldier can input in real time, [he can] pick up a radio intercept where a bad guy is talking about moving some pots [and then] do some geolocation," Arquilla says. "Now, you've got something that makes a big difference and maybe is going to save lives." The need for this type of analysis is beyond dispute. The contentious issue is which battlefield software is most useful for the task. The Army favors a big software system known as DCGS-A (Distributed Common Ground System-Army), built to Army specifications by a consortium of defense contractors; but there are other tools available. Some soldiers like a commercial, off-the-shelf program developed by Palantir, a small, but successful Silicon Valley firm. There's now a big battle over whether the Army should buy Palantir software for the soldiers who want it. "Here's what would make me happy," says Rep. Duncan Hunter, R-Calif., the leading congressional advocate for the Palantir software. "If a war-fighter wants a piece of gear — whether it's a bullhorn to scare people away from a checkpoint or a piece of software like this — and if the war-fighter can present an argument for why it works better than what [he has], and when there are other units already using it, I'd be happy if the Army were to say, 'Here you go, ground commander, here's that piece of software.' "
Hunter says the Army has vetoed numerous requests for the Palantir anti-IED software from soldiers in Afghanistan. He has letters to back him up, and is determined to hold Army leaders accountable for their reluctance to approve the wider use of the Palantir program. The Army is conducting its own investigation into the Palantir requests, and Hunter is pushing for an outside inquiry as well. "They're stonewalling," says Hunter, "while we have soldiers out there losing their limbs." With more than 80,000 troops on the ground in Afghanistan, however, it is hard to gauge the real scope of demand there for the Palantir software. "I'm not sure that there are that large a number who have that strong a feeling," says Kathleen Carley of Carnegie Mellon University, considered by many to be the godmother of data-network analysis as applied to war-fighting. "My guess is, it's more of a small vocal minority." Carley, whose computer science team developed a network-analysis tool known as ORA, points out that Palantir is just one of several software programs used in Afghanistan, in addition to DCGS-A. "We know a number of people who are using, for example, the Pajek system, which comes out of Europe," Carley says. "Another group is using UCINET. Another group is using Analyst Notebook or I-2, and another group is using ORA." All are rival software programs with battlefield applications. Carley suspects that Palantir is distinguished from its competitors in part by its superior marketing efforts. Army officials declined to comment on their reluctance to invest more in the Palantir software, pending its own reviews. But Dean Popps, who served as the Army's acquisition executive from 2008 to 2010, says the Army has to make thousands of purchasing decisions, and each one has to be made responsibly. The request for Palantir software should not be automatically approved, he argues. "You have to look at cost and performance and schedule," Popps says. "I [would] need to go to the Training and Doctrine Command and ask, 'Is this a legitimate requirement?' I need the Army to validate it. It may be a soldier's or an officer's good idea out in the field. [But that] doesn't mean it's necessarily a validated requirement." Hunter dismisses such procedures as "bureaucratic baloney," but Popps says the process is meant only to protect the interests of U.S. taxpayers. "It very much is bureaucracy," Popps concedes. "But I would assert that matters as complex as [an acquisition decision] require a very competent bureaucracy. Otherwise, you're going to have havoc." In the past, the U.S. military has generally worked with established defense contractors familiar with operational requirements. That goes for the software business as well. The DCGS-A software was developed by Raytheon, Lockheed Martin, and other big defense firms. But the Naval Postgraduate School's Arquilla, an expert on the future of war, says the U.S. military is moving into an era when it'll need to be agile and creative. In the commercial world, those are traits associated with small Silicon Valley firms, like Palantir. "We're going to [have] a military of a lot of little things in the future," says Arquilla, "and in order to pull that off, I think we have to have an acquisition program that is made up of a lot of little things, a lot of little vendors, a lot of little contracts." Arquilla says this is an inevitable change that is occurring, and he is not surprised that there is friction, to put it mildly, associated with it. Hunter and other members of Congress on the Palantir side are ready to confront Army leaders who want to stick with their own software, but the Army is not backing down. This dispute over what software to buy could soon be just as fierce as the old ones over what ships or bombers to build. Military commanders, government officials and politicians have long argued over how military dollars should be spent, and which weapon systems are needed. But one of the biggest battles these days, is over what software programs soldiers in Afghanistan should have. As NPR's Tom Gjelten reports, it's a defense budget dispute for the digital age. TOM GJELTEN, BYLINE: Soldiers once went into battle armed only with a rifle. Now, they need a laptop. John Arquilla, of the Naval Postgraduate School, says victory no longer depends just on having guns. JOHN ARQUILLA: We're now using information as well. And the more you know, the less of the older kinds of weapons you need. GJELTEN: Information, data. And to process that data, you need computers and software. Take the biggest problem in Afghanistan: roadside bombs, or IEDs. Soldiers now deal with them by gathering and analyzing information about where bombs are being planted, by whom, using what materials. With the right software, they can actually identify the network behind a bomb-making operation. ARQUILLA: If you have a system that a soldier can input in real time; that is, he picks up a radio intercept where a bad guy is talking about moving some pots - they call IEDs pots, over in Afghanistan - and they're able to do some geolocation; well, now you've got something that makes a big difference, and maybe is going to save lives. GJELTEN: The need for this type of analysis is beyond dispute. The issue is which battlefield software is most useful. The Army favors a big software system built by a consortium of defense contractors, but there are other tools available. Some soldiers like a commercial, off-the-shelf program developed by Palantir, a small but successful Silicon Valley firm. And now, there's a big battle over whether the Army should buy Palantir software for the soldiers who want it. Republican congressman Duncan Hunter is leading the Palantir charge. DUNCAN HUNTER: When the war-fighter needs a piece of gear, if the war-fighter can present an argument of why it works better than what they have - and there's other units already using it, like there were in Afghanistan - what'd make me happy is if the Army were to say: Here you go, ground commander. Here's that piece of software. GJELTEN: Hunter says the Army has vetoed some soldier requests for the Palantir software, and he's got a pile of letters to back him up. But it's hard to gauge the real scope of demand for Palantir, from the thousands of soldiers in Afghanistan. KATHLEEN CARLEY: First off, I'm not sure that there are a large number who have that strong a feeling. My guess is, it's more of a small, vocal minority. GJELTEN: Professor Kathleen Carley, of Carnegie Mellon University, is the godmother of network analysis, as applied to war-fighting. She suspects Palantir is just very good at marketing its software over its competitors. It's hardly the only option. CARLEY: We know a number of people who are using - for example - the Pajek system, which comes out of Europe. Another group is using UCINET. Another group is using Analyst Notebook, or I-2; and another group's using ORA. GJELTEN: Rival software programs, all with battlefield applications. 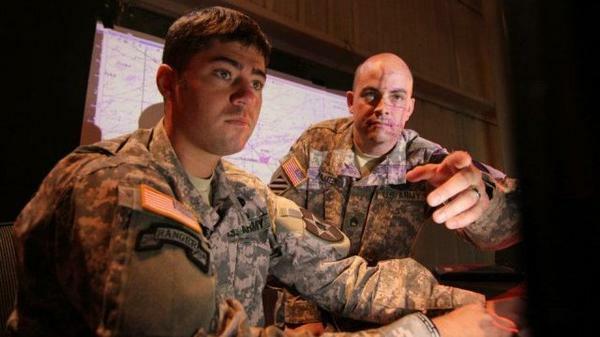 The Army is not commenting on its reluctance to invest more in the Palantir software. But Dean Popps, a former Army acquisition executive, says any Army purchasing decision, even for one software product over another, has to be done responsibly. DEAN POPPS: I need to back to the Training and Doctrine Command, saying to them: Is that a legitimate requirement? It may be a very good idea; it may be a soldier or an officer's very good idea out in the field. It doesn't mean that it's necessarily a validated requirement. GJELTEN: You know what it sounds like? It sounds like bureaucracy. POPPS: It is. It very much is bureaucracy. But I would assert that matters which are as complex as that, require a definitive bureaucracy - and a very competent bureaucracy. Otherwise, you're going to have havoc. GJELTEN: U.S. military has generally worked with big defense contractors familiar with operational requirements. That goes for the software business as well. But the Naval Postgraduate School's John Arquilla, an expert on the future of war, says the U.S. military is moving into an era when it'll need to be agile and creative. In the commercial world, those are traits associated with small Silicon Valley firms, like Palantir. ARQUILLA: We're going to made of a military of a lot of little things in the future. And in order to pull that off, I think we have to have an acquisition program that is made up of a lot of little things - a lot of little vendors, a lot of little contracts. You know, the way we fight is going to influence the way we acquire things. And so I think this is an inevitable change that's occurring, and it doesn't surprise me at all that there's friction associated with it. GJELTEN: Friction is right. Duncan Hunter, and other members of Congress on the Palantir side, are ready to confront Army leaders who want to stick with their own software, but the Army is not backing down. And this dispute over what software to buy, could soon be just as fierce as the old ones over what ships or bombers to build.